IPL 2019: KXIP has got off to a flyer, thanks to Gayle. 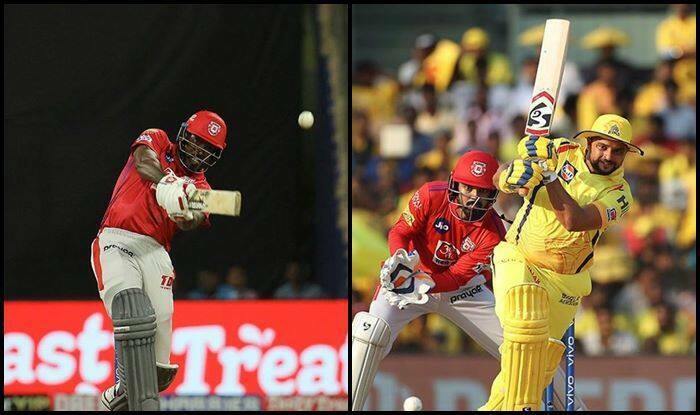 IPL 2019: Chris Gayle surpassed Suresh Raina to another IPL record during MI v KXIP at Wankhede Stadium. Gayle pipped Suresh Raina to hit most sixes against Mumbai Indians in the history of IPL. Raina held the record and now Gayle has gone past his 35 sixes against MI. Gayle has a reputation of clearing any venue easily and against MI he gave fans a glimpse of that early as he sends the ball out of the park three times inside the powerplay. KL Rahul-Chris Gayle also surpassed Dhawan and Ingram to register the highest partnership for any wicket against MI when they were on 85. Here is a video where Gayle can be seen in a relaxed mood as he shares a joke with old teammate Yuvraj Singh in the dressing room ahead of the match. Meanwhile, Mumbai Indians stand-in skipper Kieron Pollard won the toss and elected to bowl against Kings XI Punjab in an Indian Premier League match, here Wednesday. Mumbai Indians have rested regular skipper Rohit Sharma, who suffered leg spasms during practice and has been replaced by Mumbai Ranji team’s top-order batsman Siddhesh Lad. Kings XI Punjab injured Mayank Agarwal has been replaced by Karun Nair while Hardus Viljoen takes place of Mujeeb ur Rahman. At the time of filing the copy, KXIP was 70/0 in eight overs. Rahul is on 41*, whereas Gayle is on 28*. KXIP will be looking for a big first innings total. Mumbai Indians: Kieron Pollard (c), Quinton de Kock, Suryakumar, Siddhesh Lad, Krunal Pandya, Ishan Kishan, Hardik Pandya, Rahul Chahar, Alzarri Joseph, Jason Behrendorff and Jasprit Bumrah. Kings XI Punjab: Ravichandran Ashwin (C), Lokesh Rahul, Chris Gayle, Karun Nair, Sarfaraz Khan, David Miller, Mandeep Singh, Sam Curran, Hardus Viljoen, Mohammed Shami and Ankit Rajpoot.